They are applying heat and pressure on microalgae, exploring a method to create affordable biofuel that could replace fossil fuels. They also hope to use the byproducts of bio-oil production as feedstock for more biofuel. Savage and his team, funded by a $2 million National Science Foundation grant, aren’t the only ones trying to make bio-petroleum. California startup Sapphire Energy says it could produce 1 billion gallons of algal fuel annually by 2025. Blue Marble Energy creates fuel using algae found in polluted waters. Chevron has joined San Francisco company Solazyme in developing algal jet fuel. “This research could play a major role in the nation’s transition toward energy independence and reduced carbon dioxide emissions from the energy sector,” Savage said. Such fuels are attractive because they are direct replacements for petroleum and compatible with existing infrastructure. Proponents argue such fuels are carbon neutral because the emissions created by burning them are offset by the CO2 absorbed by the algae as it grows. 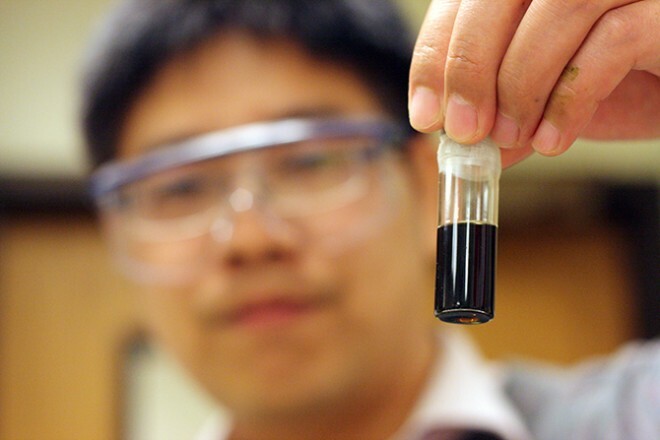 Although algal biofuels are feasible, there is some concern about the quality of the refined product and its performance in cold temperatures, said Spencer Quong, an automotive engineer and alt-fuels expert with Quong and Associates. There also are questions about the carbon-reduction benefits because obviously it requires energy to produce and process the fuel. “Just like when you are using a pressure cooker at home, their algae pressure cooker needs to be heated and if they are using electricity or natural gas to heat the system there will be carbon emissions that lead to climate change,” said David Friedman, research director of the clean vehicles program at the Union of Concerned Scientists. Microalgae are, as the name suggests, microscopic algae. They break down more easily than other biofuel feedstocks because their cell walls aren’t as tough. Algal fuel typically requires cultivating specific species of algae, drying it and extracting its oil. The method Savage and his colleagues are exploring uses less oily types of algae and eliminates the need to dry the algae. That simplifies the process and clears big hurdles to commercial scale production of algal fuels. Using high temperatures and pressure lets the algae react with water and break down, releasing the native oil. 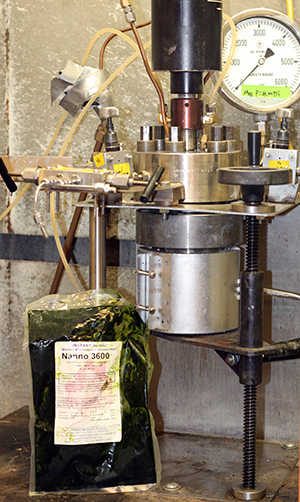 Proteins and carbohydrates within the algae also decompose, increasing the fuel yield. With that in mind, Savage and his colleagues are looking at using catalysts to increase the energy density of the algal fuel. They also hope to reduce its viscosity and cut its sulfur and nitrogen content. The researchers clearly have a lot more work to do, and there many unanswered questions about algal fuels. Can it be produced affordably? Can it be made fast enough, and with minimal environmental impact? Photo: Nicole Casal Moore / University of Michigan. Graduate student Peigao Duan holds a vial of bio-oil made at the University of Michigan.